This is a 41-page guide. This is a 626-page guide. Protecting the health and well-being of children, staff and families is an important component of a child care program. Our Child Care Aware Health and Safety consultants provide information and training on a variety of topics to help child care providers create and maintain a safe and healthy environment for children. Caring for Our Children is a comprehensive resource which encompasses every aspect of child care. Visit the Caring for Our Children website for more information. The North Dakota Childcare/School Infection Control Manual includes specific information on how to control the spread of illness in your child care. Giving over-the-counter and prescription medication is a big responsibility. It is important to obtain authorization, follow licensing requirements, and implement best practices to reduce your liability risk. This includes products such as Tylenol, Motrin, etc. This apples to products such as diaper ointment, sunscreen, insect repellent etc. There are many types of emergencies that could potentially occur in child care: anaphylactic reactions, injuries, storms, fire, etc. Having a first aid kit readily accessible - on-site and off-site - can help you respond quickly. Licensing requires an incident report to be filled out when the child has been seriously hurt, hospitalized or died. For any incident report, it is recommended to obtain the parent’s signature, give parents a copy, keep a copy in the child’s file and one in an incident log binder. Incident reports should be kept until the child is 18 years old. 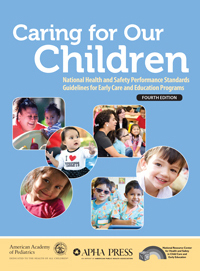 Keeping children safe is the first priority of any child care program. While all injuries cannot be prevented, providing safe environments and active supervision decreases the possibility. Following proper procedures for sanitizing surfaces, handwashing and having exclusion guidelines in place decreases the spread of germs and keeps everyone healthier. Child Care Aware Health Consultant, Sarah Myers, demonstrates how to set your work space and prepare a bottle of formula in a chld care setting. Child Care Aware Health Consultant, Sarah Myers, demonstrates how to clean and sanitize food prep and eating areas in a child care setting. Child Care Aware Health Consultant, Sarah Myers, demonstrates best practices for handling dishes, glasses and utensils when serving food in a child care setting. Child Care Aware Health Consultant, Sarah Myers, talks about safe and sanitary ways to prepare and serve food in a child care setting. Child Care Aware Health Consultant, Sarah Myers, shares 7 important things to remember when serving food in a child care setting. Child Care Aware Health Consultant, Sarah Myers, talks about ways that mealtime can be an opportunity for children to learn how to pass and serve food, practice manners and build social skills.